Client: I have patronized the same salon for several years now and always tipped generously. Just recently my husband and I had our new home built, which cost us a fortune. With rising gas prices and discounted prices offered at the mall, I feel the owner of the salon I go to is unfair not to consider lowering the prices of the services that I regularly request such as maintaining my nails (just for me during this financial crunch). She was almost rude when I asked her for this personal favor as a loyal client, even when I explained to her that the windows alone in my new house cost over $10,000! I’m ready to shop around for a better price at other salons. What do you think? Miss Manicurist: What do I think? I think, by all means, shop around, if for no other reason than to relieve your current salon of your selfishness. Is it possible that since you think prices should be lowered just for you that you also believe that you’re the only one burdened with rising gas prices? And since when has it been kosher to brag about the price of items included in a new home? The owner and operator that have been so gracious to put up with you “for several years now,”probably thought you could afford their prices with $10,000 windows! Too bad $10,000 can’t buy you some couth. If it could, I bet you’d still want a discount. The Lowdown: Prices, like rules, are usually set for the fairness and equality of a majority. To expect otherwise, in this case, is either cupidity or stupidity. Client: My nail tech charges a whopping $60 for a full set of nails. My bi-weekly maintenance fee is almost $40 and a repair is $9 unless you wait until your regular appointment time when she allows two for free. My nail tech is artistic and excellent at her trade, but I’m not wealthy! I’ve been a faithful customer for so long, I feel like at least my repairs ought to be free. Especially if I wait until my regular appointment time! Whenever I go ahead and have my check written and exclude any repair costs, she adds an additional fee to my next appointment! Don’t you think this is over-the-top? Miss Manicurist: Oh, yes, I think it is definitely over-the-top for a nail tech who is “artistic and excellent at her trade” to do anything for free! Are you such a dodo that you’ve failed to appreciate the rarity and worth of a true artist in her field? There are many towns where your tech could charge a “whopping” $120 for a full set of nails, but yet you think you should be able to abuse her work and she should fix it for free. Wake up, dearie, to the land of awareness where when you write a check for any amount less than what’s owed, you’re considered a thief. The Lowdown: Having your nails done is a rewarding luxury that you can either afford or not, so stop trying to cheat for it. Client: I showed up at my salon the other day for my appointment, but since I hadn’t had a pedicure in a while, I decided to have my toes done instead of my regular nail appointment. When I told my nail tech what I wanted to have done, she acted surprised, almost in a snappy way, then huffed off to prepare my bowl. A pedicure costs more than a manicure, so what was her problem? Miss Manicurist: Just showing up to announce exactly what service you’ve chosen to have at the last minute? Excuse me? I’m snapping and huffing just thinking about it. Since you obviously have no respect for your poor technician, let me fill you in as to how her schedule clicks. A pedicure can take up to one hour and fifteen minutes (not to mention that if she’s having back problems, she may have purposely not scheduled any pedicures that day) while a basic manicure may only require a 30-minute slot. Different services require different implements, supplies, space, and preparation. More than likely the pedicure area is shared with other nail techs and their patrons, who are also on a tight schedule. Are any light bulbs coming on? The Lowdown: If you wish to change a requested service, call at least one hour ahead (preferably a day ahead), and ask your nail tech (in a nice way, of course) if she would mind changing your service and if her schedule will allow it. If it works out for you, tip heavily. Client: Lots of times I can’t afford the time or the money to splurge on a one-hour pedicure, and many times during the summer I have let my manicurist give me a re-polish for my toes instead. Just recently, I received a letter from my nail tech stating that her salon would no longer offer this service, but advertised all the different pedicures available. I hate this so much because I’ll go broke keeping up the appearance of my toes! Why on earth would they do this? It just sounds greedy to me. Miss Manicurist: Well it sounds to me as though you would know plenty about being greedy. Listen up, and I’m speaking to all of you taking advantage of beauty personnel across the globe. The reason you liked your re-polishes so well is because they require a lot more work for your mistreated nail tech, and a lot less money from you. Kudos to her and her salon for dropping this service. They would not have dropped it if it wasn’t costing them time and money. In order for a re-polish to be successful and look beautiful, a nail tech must deal with excess cuticle, shape the nail, and cleanse properly before she applies polish. In other words, to keep up the appearance of your toes and her reputation, she essentially has to do a mini-pedicure at a discounted price that you obviously expect. The Lowdown: The only other viable option I think your salon might have considered is pricing toe re-polishes only one dollar cheaper than pedicures. Your other viable option, on the other hand, is closed-toe shoes. Client: Whenever I call to make an appointment to have a nail repair, my nail tech usually cuts me off in the middle of my explanation, never giving me time to explain what happened. I value her work so much, and I want her to know how careful I am and exactly what happens when I need a repair. Is it just me or is she being inconsiderate to cut me off and bark out an available time? Miss Manicurist: It’s just you. During the course of a day, your nail tech probably fixes in the neighborhood of about 100 nails. 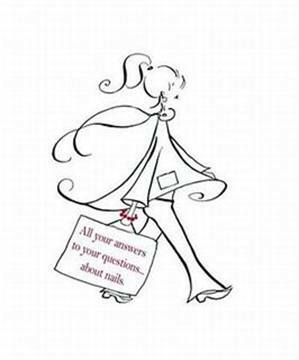 Do you really think she cares (or has the time) to learn the drawn out reasons behind each and every nail disaster? I mean, wake up. You hit the bed post; it’s lost in your husband’s hair; you burned it with a cigarette. Who cares? Your nail tech has heard every nail accident this side of the equator, and I assure you, she doesn’t care how you broke your nail. It only sounds as if you’re trying to put the blame on her work when you insist on a long boring tale of breakage. The Lowdown: Don’t be one of those pests on the phone who take 10 full minutes to say something that should take only 60 seconds. Make the appointment and shut up. Ninety-nine other fingernails are waiting for their turn. About the Manicurist. The Manicurist — aka Rebecca Seals — is a licensed cosmetologist, esthetician, and salon owner with 18 years experience in the beauty industry. She has traveled many roads in the U.S. preaching and teaching the gospel as she sees it.